The wildly popular fantasy HBO TV series 'Game of Thrones' will be returning for its sixth season later this month, and in advance of this a team of US-based researchers have applied a mathematical algorithm to ask the most potent question about the world of Westeros: who exactly is the real main character? Fans of both the TV show and the 'A Song of Ice and Fire' books by George R.R. Martin have long debated who the real hero of the complex narrative that spans dozens of interweaving characters is. Is it Daenerys Targaryan, the 'Mother of Dragons?' Is it a member of the Stark family, Arya or Sansa? Jon Snow, leader of the Night's Watch? Or is it quick-witted and wily Tyrion Lannister? Andrew J. Beveridge, an associate professor of mathematics from Malcalaster College in Minnesota and Jie Shan, an enthusiastic undergraduate, have applied a mathematical algorithm based on the increasingly important field of network science to help answer this question. Network science is essentially a branch of applied graph theory that studies complex networks, such as computer networks, telecommunications networks, biological networks, cognitive and semantic networks, and social networks. The field draws from several disciplines, including mathematics, physics, economics, sociology, and computer science. Network science considers distinct elements or actors represented by 'nodes' (or 'vertices') and the connections between the elements/actors as 'links' (or 'edges'). In essence, it examines how information flows from one place or thing to another. 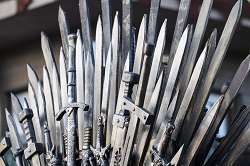 Subsequently the researchers believed that the 'Game of Thrones' world, with its constantly shifting allegiances, the rise and departure (often by brutal means) of key characters, and constantly shifting settings was a perfect testing ground for demonstrating the importance of network science in today's increasingly interconnected world. 'This is a fanciful application of network science,' explained Prof. Beveridge. 'But it's the kind of accessible application that shows what mathematics is all about, which is finding and explaining patterns.' The research, entitled 'Network of Thrones' is published in the prestigious 'Math Horizons', the journal of the Mathematical Association of America. The team chose the third book in the series, 'A Storm of Swords' and pinpointed every time two characters appeared within 15 words of one another. The more often those names appeared together, the more weight the link between the two characters was given. As this process continued, they constructed a large-scale network structure encompassing all characters and dividing them into extremely accurate communities that highlight the geographical, familial and even adversarial ties between them. 'We didn't tell it [the network] what the communities were, the network actually tells you what the communities are,' said Prof. Beveridge. With the completion of the intricate social network between the characters, the team then ranked them by several different measures. One, called 'degree centrality,' simply ranks the characters by how many others they're connected with. Another, called 'PageRank,' an algorithm used by Google's search engine, rewarded characters based on how important their associates are. So who is the most important character? Tyrion Lannister came top in all but one measure, making him the key lynchpin character of the series, with Jon Snow a close second. Interestingly, Jon Snow beat Tyrion in the 'betweenness' measure, which assessed a character's influence over other groups. Daenarys Targaryan was also an interesting result, not rating as highly as expected. This is because in 'A Storm of Swords' she is geographically isolated from many of the other key characters. However, she becomes far more important in the later books and that's somewhat predicted by the research team's network – the few links she did have were with other extremely important characters. Whilst it's both fun and whimsical to apply a serious scientific field to a fictional world that has fascinated and enthralled millions, there are many real world practical applications emerging for network science. Arguably the current most pressing application is the use of the field to assist national security agencies and police forces to help study and break global terrorist networks. Though if the network science model is able to prove itself against the violent and complicated realm of Westeros, then surely this momentous and crucially important intelligence task could definitely be within its capabilities.